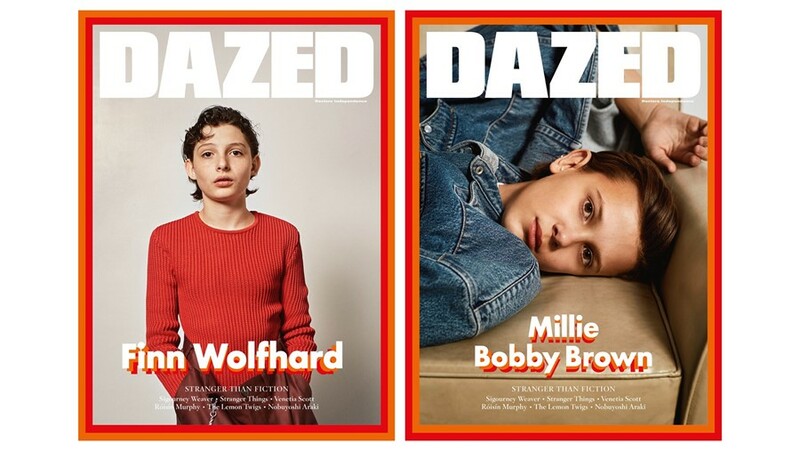 Tracing the roots of a telekinetic TV phenomenon, the winter 2016 issue of Dazed delves deep into the universe of Stranger Things, the sci-fi spectacular that’s awoken the wide-eyed kid in all of us. On the covers, enigmatic young stars Millie Bobby Brown and Finn Wolfhard open up on the show that turned their worlds (and ours) upside down, as they come face to face with photographer Collier Schorr. Reaching further into the unknown, we investigate how a televisual take on mythical 80s suburbia came to define the cultural zeitgeist, with contributions from the Duffer brothers, Shawn Levy and Stuart Vevers. Gaten Matarazzo, Caleb McLaughlin and Joe Keery front our in-depth Stranger Things cast portfolio, while Nancy Dyer and Charlie Heaton relive their experience facing down a Demogorgon. Plus, we go deep on the art of spine-tingling soundtracks with cult musicians Kyle Dixon, Michael Stein, Mica Levi, Julee Cruise and Johnny Jewel. Sci-fi’s first lady Sigourney Weaver reveals she won’t stop looking to the future; disco siren Róisín Murphy reveals her life’s mission to unsettle and amaze alongside a surreal shoot as lensed by Casper Sejersen; rock’s teenage saviours The Lemon Twigs give good glam in a story shot by Fumi Nagasaka; youth-culture chronicler Gareth McConnell reimagines his personal archive in a bid to uncover the lost Eden of the ecstasy generation; and K-pop shapeshifter G-Dragon comes under the lens of Japan’s master of provocation, Nobuyoshi Araki. In fashion, Venetia Scott presents a breathtaking vision of a post-apocalyptic landscape; Joanna Piotrowska shoots for the moon in a story for Fendi inspired by cult illustrator Kay Nielsen; Mark Peckmezian gets inside your head with stylist Agata Belcen; and Jamie Morgan takes us on a trip through the Paris you don’t see in the movies.